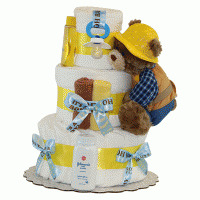 Our new & exciting Duckie Changing Pad Diaper Cake Log from Silly Phillie has it all. 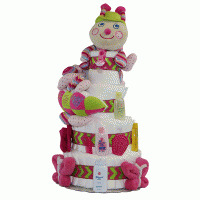 It is visually unique, totally adorable, impressively large (25" x 14" x 8"), and it's made with quality items for the newborn baby. 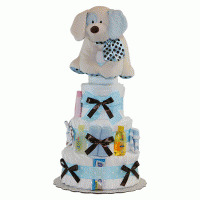 It is a gender neutral gift that can be given to either a baby boy or girl, or given as a baby shower gift or centerpiece. 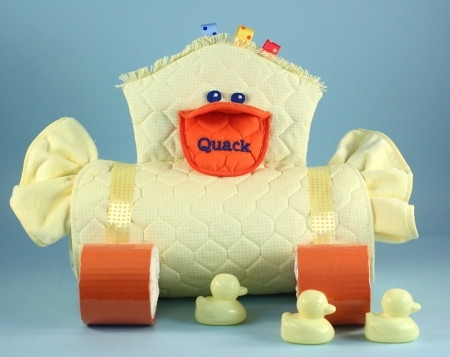 Duckie Changing Pad & Diapers Among the many items in this thoughtful gift, is a fabulous Duckie Character Changing Pad. Designed and made in the USA from two-ply quilted fabric, this changing pad is as practical as it is cute, providing a soft and supportive surface for baby during diaper changes or floor play time. It is easy to roll up and travel with and it will keep it's good looks after many washings. 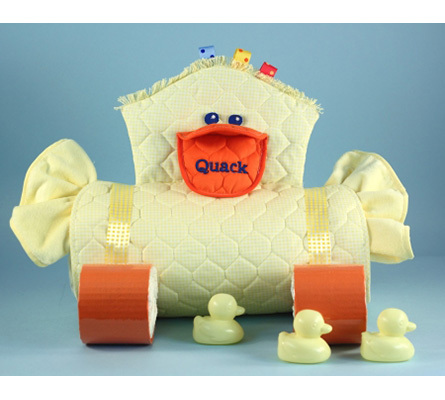 Complete Gift Contents Duckie Changing Pad 28" x 18" 12 Newborn sized diapers hooded terry towel flannel receiving blanket 2-terry burp pads 1- duck bath floatie Presentation & Size Each Duckie Changing Pad baby Gift is custom made to order in the USA by experienced gift professioinals. It will be assembled as shown then gift wrapped in tulle to arrive looking fantastic. To make this gift even more unique, we can personalize the changing pad by embroidering baby's name on front. The additional cost is $7.50. To add personalization, simply choose that option during checkout and input baby's name in the intended field. Either way, everyone will go quackers over your gift!